The men who departed to join the Main Body of the New Zealand Expeditionary Force on 13 August 1914, and the days after, were all volunteers. They were a mixture of serving Territorial Army soldiers, and civilians who met the requirements of the Defence Department. Some had served in the South African War (1899-1902) and a few were ex- British Army soldiers. There was a spread of urban and rural volunteers. Territorials firstly applied to their units, while civilians applied at their local army drill hall. All volunteers were medically examined in Masterton before acceptance. Mounted rifle volunteers were asked to bring a horse, which also had to pass army standards before being accepted and purchased by the Defence Department. Volunteers who were Territorial officers and NCOs (non-commissioned officers) were expected to take a leading part in the process and most of them went into camp as probationary leaders. 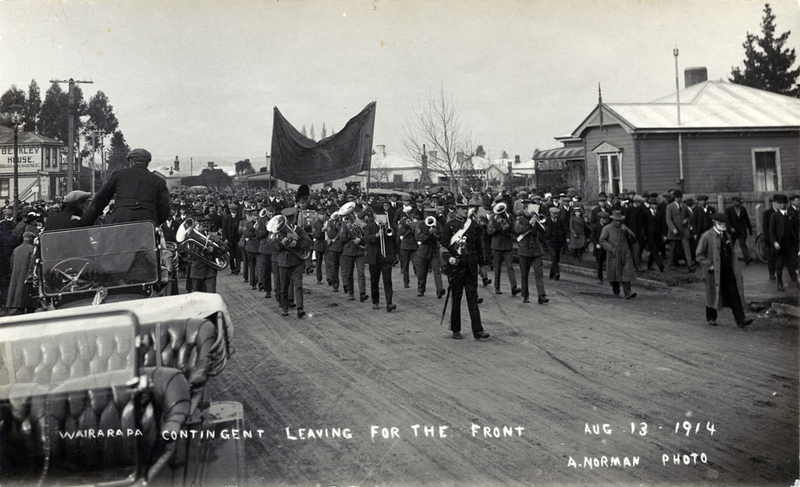 The build-up of the Territorial Army to 25,000 by 1914 enabled New Zealand to field an all-arms expeditionary force, partly-trained, within two months of war commencing. Never before or after has New Zealand been in such a prepared state for war. The stories in the exhibition represent men from all around the Wairarapa district. They ranged from 20 to mid-30s in age, labourers to professionals. Some served the whole war and others did not survive.